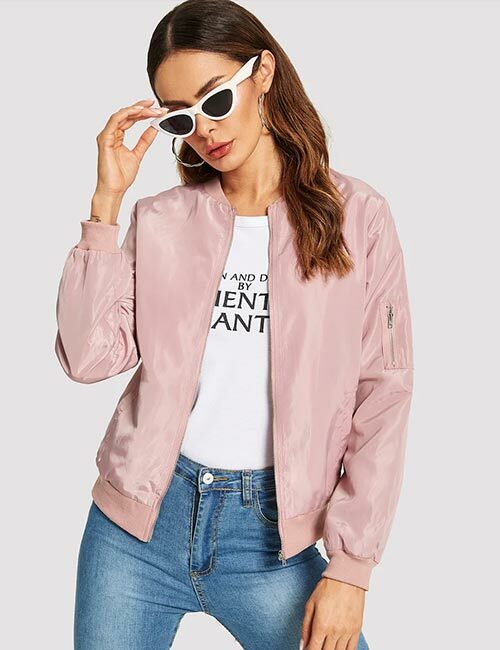 A jacket that is a perfect ‘in-between.’ In-between seasons, casual and sporty, sporty but not overtly, biker chic but every day – the bomber jacket is all of that for you. It fills the gap on days you want to put no effort but still have to look put together. Invest in one or invest in many, you are going to lose barely any. We’ve put together looks that reiterate this – check them out! The aviation industry inspired the bomber jacket as pilots donned these while stepping out for flying. From there, the style caught on to men and trickled down to the women’s clothing line too. 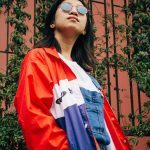 It has evolved ever since, and there’s not one correct or classic style with a bomber jacket – which is what makes it versatile. The way to recognize a bomber jacket is that it has a gathered waistband with a thick elastic band. 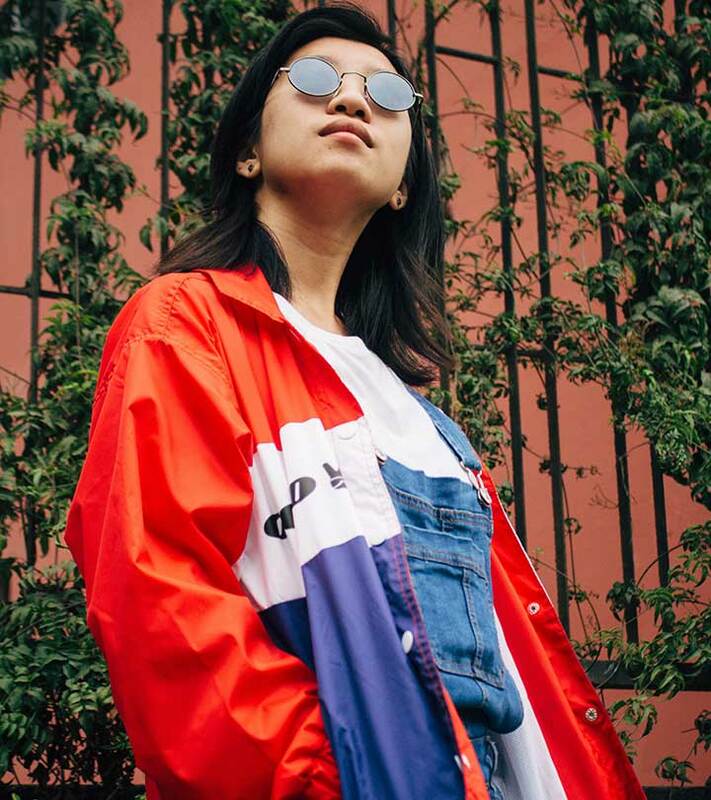 Bomber jackets look great with simple, bold T-shirts or tops. Since they have a pretty sporty and comfortable vibe, they usually work well with casual outfits. Make sure your bomber jacket is neither too loose nor too tight. It must also sit comfortably over your hips, and the collar must rest well on your neck without collapsing on your shoulders. Here are some styling ideas for you. Take a look! For the love of camo and the fact that we can never get enough of this, invest in a camo jacket. Whether you are 20, 30, or over 50, this jacket comes handy for the longest. 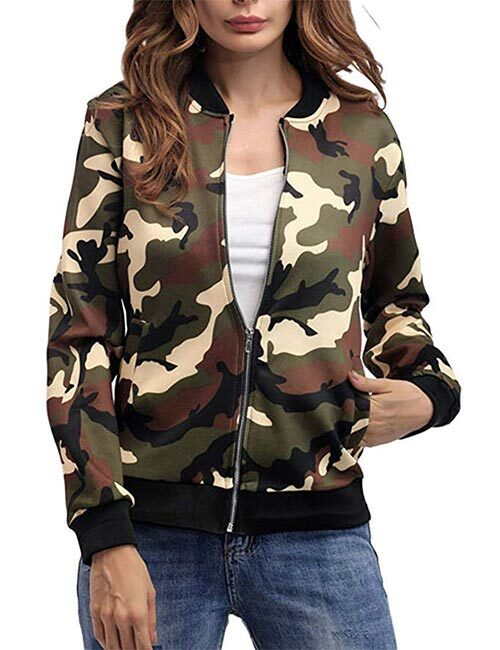 It checks off the list for two things at once – camo and bomber. Play with patterns and prints, they say, so here we are doing just that. If you are like me and live in black leggings, jeggings, treggings, etc., you need one of these. It lets the print stand out and take center stage – which is what this deserves. Even if you are a tomboy and do not like the idea of anything too girly, you won’t be able to resist this. 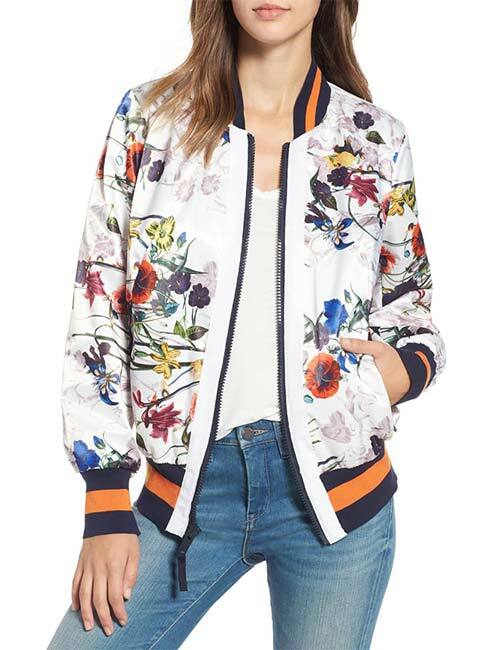 The bomber style brings out the best of the floral prints and in a very unassuming way. An all pink suit with a bomber style jacket is like holding to the love of all things pink but without throwing it on your face. If you love tracksuits, you should get one of these. A windbreaker bomber leather jacket, cropped, with a ribbed knit trim and dropped shoulders, and long dolman sleeves are what all jacket dreams are made of. Wear it with a tube style tracksuit, skinny jeans, or pencil skirts to balance toughness with the feminine. Boyfriend style meets cardigan meets bomber jacket very subtly. The long coat in faux shearling defines the street style and effortlessly so. Pair it with a distressed pair of jeans or frayed shorts – it’s foolproof! If you are a Marvel fan, you need no convincing here. 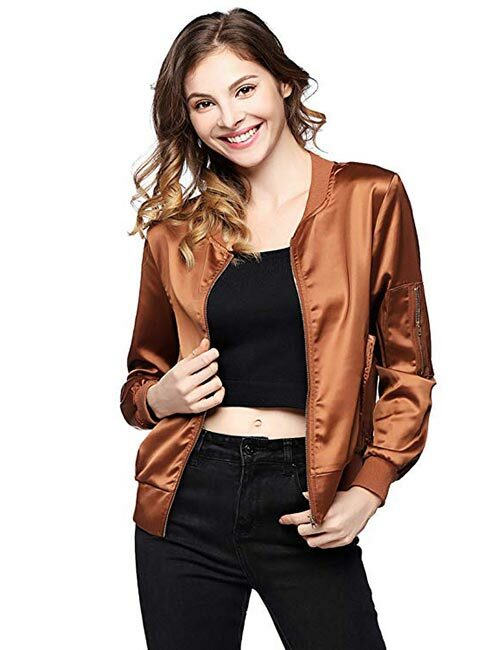 The patches to ornate the soft faux leather jacket keep the feminine shape of the jacket intact but with boyish attitude. Wear it with jeans, tracks, or trousers – you are going to love it. Are you a fan of the styles from the 80s and the 90s? Retro defines you, but you don’t want to overdo it? The satin bomber jacket packs all of this in a go. It looks especially great with white jeans. How about bringing both faux fur and leather together? 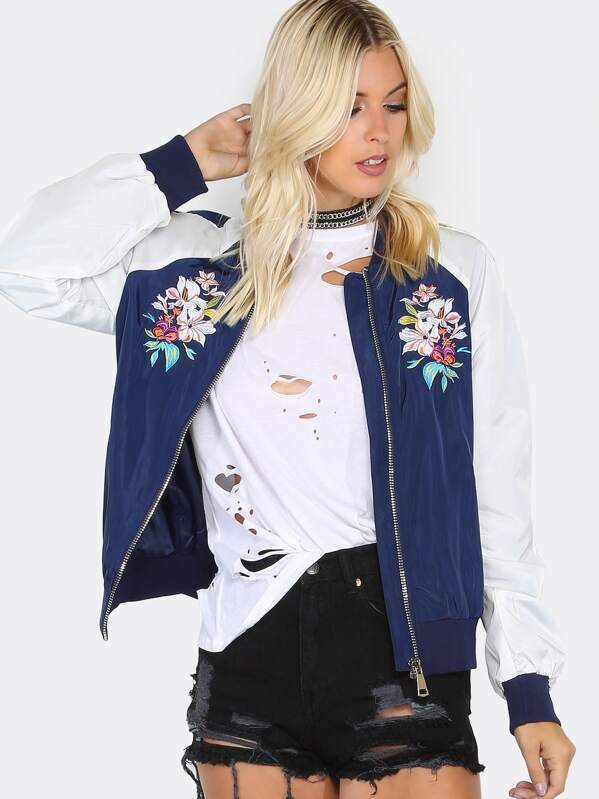 A little bit of this and that makes this stylish, fun, and feminine too – but without losing the sight of the bomber style. It has a sophisticated vibe to it, so you can wear it to brunch or a movie date. If you are a fan of animal prints, go all out with this Zebra printed bomber jacket. You can wear it over leggings or track pants and spin your outfit in a matter of minutes. Or, if you want to pull a Taylor Swift or Gigi Hadid street style, swap the pants for a leather skirt and OTK boots with this. Work in the media? Freelancer? You know you can still work yourself around with a bomber jacket. It perfectly meets business and casual midway. Wear it with a pencil skirt and silk blouse or with tapered pants and a tank top, or even with a one-piece form-fitting dress. Quilted, cropped, and bomber – cannot get better than this, can it? Wear it with a bodysuit over shorts and look like a diva right out of a poster. The signature military jacket in beige breaks the idea of the classic military color but doesn’t take away the essence of the style. 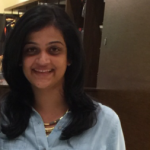 It looks ravishing on tapered or cropped jeans, smokey eyes, boots, red lipstick, and aviators. 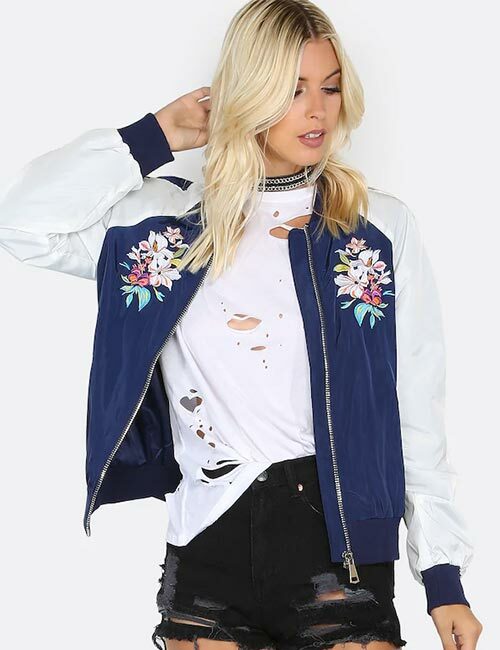 Embroidered bomber jackets are the cutest – they look flattering and feminine but just in perfect proportions. Wear one with long flowing skirts, tube skirts, or body-hugging casual dresses. Talk about chic! Choose any of these looks and go slay! Now that you have decided to invest in a bomber jacket, it is important to know how you can wash it so that it lasts long. A lot depends on the material. Jackets made from polyester are easier to wash than those made from leather or other fabrics. In the case of the latter, it’s better to get them dry cleaned. You can also soak it in mild detergent (fabric appropriate) and rinse it with your hand. Hang it dry. These are not supposed to be ironed. Plus, they adjust back into their shape without wrinkles in no time. A bomber jacket is a great value add in your closet and an investment you will be pleased with. Are you a bomber jacket hoarder? Or, are you a newbie? Let us know by dropping in a message in the comments section below.